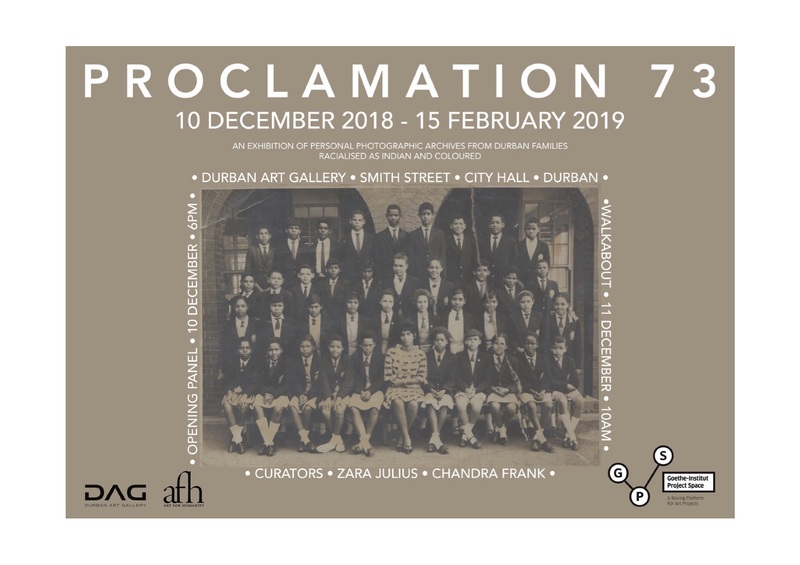 The exhibition Proclamation 73 comes forth out of a project initiated by Zara Julius and Chandra Frank that explores the family archives of people racialized as coloured and indian in Durban under the 1950 Group Areas Act. Inspired by their own family histories, Julius and Frank set out to collect family photos of everyday lived experiences. Proclamation 73 portrays narratives on the meaning of loss, kinship and home through drawing on the family album. The presented collection includes photos of weddings, beach days, ballroom dance contests, street portraits, and other snapshots. The exhibition investigates and challenges how different racial histories and segregation continue to operate within the city of Durban and its surroundings. Through weaving representations of “the everyday” together with photos of the aftermath of forced removals, Proclamation 73 seeks to disrupt static racial categories, especially taking into account how categories such as ‘coloured’ and ‘indian’ were used as tools of antiblackness. The exhibition takes its title from the Proclamation 73, issued in 1951, in which indians were further categorised as a subdivision of people racialised as coloured. This further complicates the arbitrary nature of racial classification under the apartheid regime. Proclamation 73 covers a large time period, and takes a non-linear approach to the fragmented narratives and histories that emerge out of this project – working with archives that are rarely viewed alongside each other. Through portraying a wide variety of images, archival materials, and selected work from the collection of documentary Afrapix photographers Peter McKenzie and Rafs Mayet, invites viewers to think through questions of representation, erasure, and intimacy. profit project in partnership with the Goethe-Institut South Africa as part of the Goethe-Institut Project Space (GPS). Sign up for our Mailing List to stay up to date with our events. Copyright 2019 - Art For Humanity. All Rights Reserved.